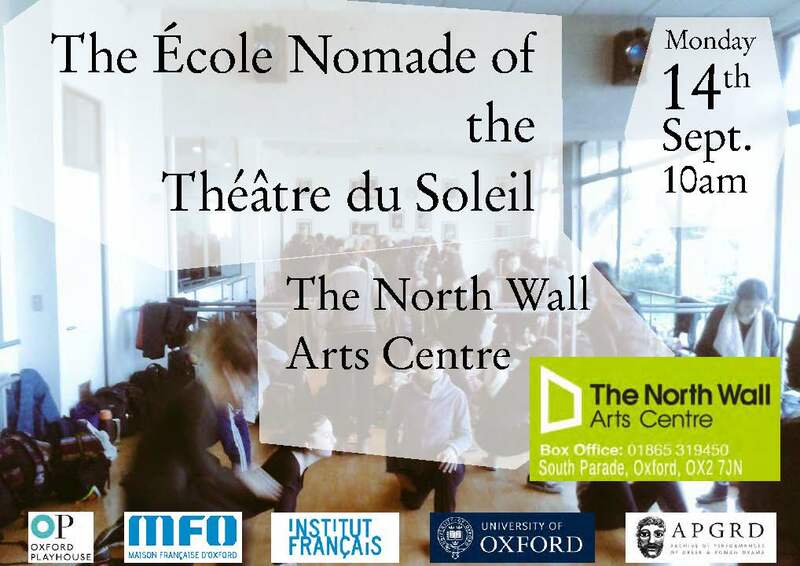 Ariane Mnouchkine’s Théâtre du Soleil brings the École Nomade — Travelling School — to Oxford, 14 to 25 September 2015. The APGRD along with the Maison Francaise d’Oxford, the Oxford Playhouse, Pegasus Theatre, and the Institut Français, are excited to announce that Ariane Mnouchkine, Europe’s foremost experimental theatre director, and five members of the radical collective Théâtre du Soleil, are bringing their École Nomade to Oxford, at the invitation of Oxford University and the Maison Francaise d’Oxford. The workshop is open to all - anyone over the age of eighteen is welcome to apply. It does not matter whether or not you have studied drama before, you must simply want to engage in the experiment of collective theatre-making. The sessions of the École Nomade, which will take place in English, and will run from the 14th to 25th September, are not drama classes. They constitute moments of practical reflection, involving improvisation, masks, music, dance, and movement, in which Mnouchkine and her troupe seek to set out, explain, and clarify their methods, and their collective way of working.